In 1839, the Reverend Father P.J. 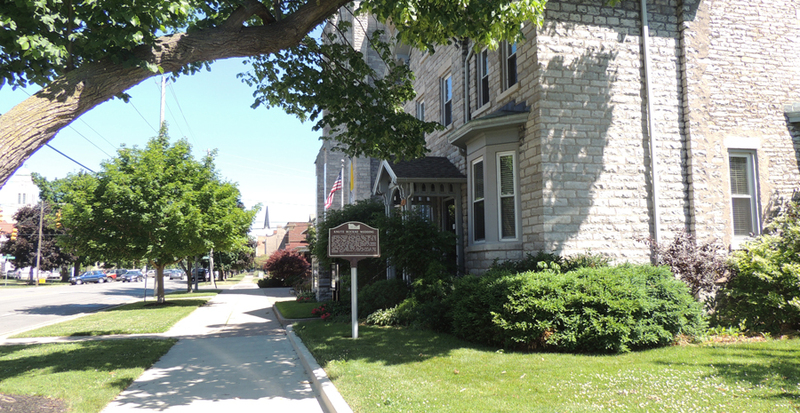 Machebeuf began visiting Sandusky to minister to the spiritual needs of the city’s growing Catholic community. He founded Holy Angels church in 1840. Saints Peter and Paul Church was founded in 1865, the second Catholic church in the Sandusky community. Most parishioners were Irish immigrants who lived in the central and eastern parts of the city. The foundation for the church was set in 1866, and the church was dedicated on Easter Sunday, 1871. The church is built from native “blue” limestone, quarried from the site where St. Mary’s Church was built in 1873-1880. It is a fine example of Gothic Revival style. Note the pointed stone window and door caps. The church was designed by Patrick Keely, a well-known designer of Victorian era churches, especially in the eastern U.S. The triple front doors is a Trinitarian theme often used by Keely. 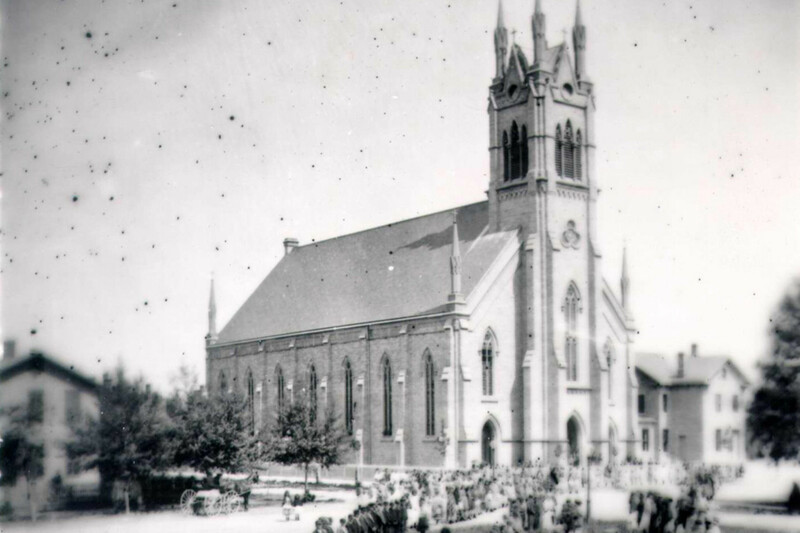 Saints Peter and Paul Church was damaged by fire in 1917, but the parish decided to renovate and redecorate the church instead of building a new church. The church was listed in the National Register of Historic Places in 1984. The rectory at Saints Peter and Paul Church was the site of the wedding of one of the most significant sports personalities in American history. On July 15, 1914, Knute Rockne, who would become the legendary Notre Dame football coach, married Bonnie Skiles of Kenton, Ohio in the church rectory. Monsignor William F. Murphy officiated. Knute Rockne and Bonnie Skiles had met the preceding summer while both were working at Cedar Point. Rockne was a lifeguard at the Cedar Point beach and Skiles was a waitress at what was then called the Grill Room in the Grand Pavilion. The summer of 1913 was propitious for Rockne. Not only did he fall in love and meet his future wife, he also, with Notre Dame teammate and fellow lifeguard, Gus Dorais, developed new techniques for using the forward pass while practicing on the Cedar Point beach. Those passing techniques were used to great effect that fall when Notre Dame used pinpoint passing to destroy a great Army team 35-13 and usher in a new age of football. Rockne became the Notre Dame head football coach in 1918. He coached for 13 seasons until his tragic death in an airplane crash in Kansas on March 31, 1931. His record of 105-12-5, a .821 winning percentage, still ranks as the best ever among college and professional coaches. He led Notre Dame to three national championships and five undefeated seasons.